Saddle Research Trust Research Associates in the UoS Equestrian Study Group are part of a large-scale multi-disciplinary project investigating the interaction of horses, saddles and riders. The group are working on several research papers that will be submitted for publication during 2014. Anne Bondi, PhD student and Solution Saddles Managing Director, is investigating how different saddle designs perform by focusing on the asynchrony of the movement between the horse, saddle and rider. She presented the preliminary findings at the International Society for Equitation Science Conference (ISES) in 2012 (see below). Elizabeth Gandy, Computer Scientist and Senior Lecturer, is developing a new software tool for analysis of the horse, saddle and rider interaction. She gave a presentation of the development and application of the system at the ISES conference (see below). 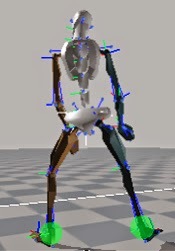 Elizabeth Gandy, Anne Bondi and Tim Pigott have carried out a preliminary investigation using the Xsens MVN inertial motion capture suit (www.xsens.com) for the measurement of hip angle rotation in the assessment of asymmetry in riders. The study revealed the presence of asymmetry in hip external rotation angles for all 12 riders analysed and found the technology to be efficient and practical, with the potential to further advance the analysis of horse and rider interactions. Future work will include validation of the technology for use in rider analysis and investigation into the potential link between rider asymmetry and lower back pain/injury risk. 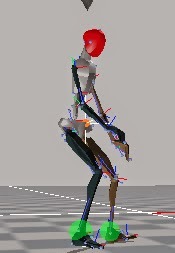 An example of the Xsens software showing rider data being captured in real time. The asymmetry of the rider's posture is clearly evident. A large team is necessary to run an SRT Study Day. 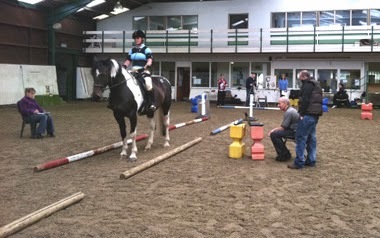 Data collection using the Xsens equipment in progress at Washington Equestrian Centre. Gandy E.A., Bondi A., Hogg, R, & Pigott, T.M.C. (2014). "A preliminary investigation of the use of inertial sensing technology for the measurement of hip rotation asymmetry in horse riders". Sports Technology. doi: 10.1080/19346182.2014.905949. Click here to view the free summary and if you wish, purchase a copy of the paper. Sorry - the free copies of the full paper have all been snapped up!